2010-2011 Humphrey International Fellow Ms. Min Shen was selected for the 2017 Distinguished Humphrey Fellows Program. Ms. Min Shen came to the Humphrey School in 2010 as director of international business development at Horizon Research Consultancy Group, the largest local independent research company in China. Ms. Shen’s extensive research experience in public opinion and social studies enables her to serve as a bridge between the public and local government in China, as well as between the Chinese and others from around the world.She has been invited to lecture to domestic and foreign research institutes and think tanks, such as the National Committee on United States-Chinese Relations, the East-West Institute, and the National Library of China. She also has helped higher education institutions such, as Tsinghua University and Southwest Jiaotong University to create courses on social entrepreneurship. Ms. Shen earned a master’s degree in classical chinese literature from Zhejiang University. Distinguished Humphrey Fellows visit the U.S. State Department to meet with Ms. Alyson Grunder, ECA's Senior Bureau Official, Deputy Assistant Secretary. 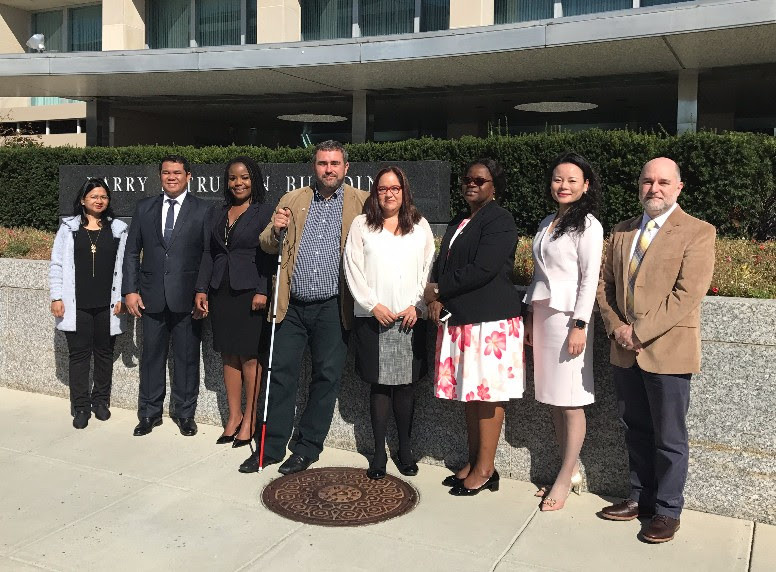 Nine senior professionals from 9 countries recently completed a three-week program in the United States as recipients of the Distinguished Humphrey Leadership Award. Designed and sponsored by the U.S. Department of State’s Bureau of Educational and Cultural Affairs, the program’s goal is to facilitate leadership development, multilateral collaboration, and cooperation on shared global challenges. The Fellows engaged in a one-week executive leadership course at the Harvard Kennedy School of Government entitled “Leadership for the 21st Century: Chaos, Conflict and Courage." After the course, each Fellow was placed in one or two organizations for a one-week, tailored job shadowing experience that exposed them to U.S. organizations or agencies in their fields. The program concluded in Washington DC with high level meetings at the U.S. Department of State, where the Fellows were presented a certificate by ECA's Senior Bureau Official, Deputy Assistant Secretary Alyson L. Grunder. Learn more about their visit here. In addition, Fellow Oleg Kolpashchikov participated in a Facebook Live session with Charlie Kellett, Foreign Affairs Officer, International Disability Rights team in the Bureau of Democracy, Human Rights, and Labor, U.S. Department of State. They talked about advancing disability rights in Russia in honor of National Disability Employment Awareness month. Pictures below are from the Fellows' visit. From top left to bottom (clockwise) they include a reception at MIT with BU and MIT fellows and a Humphrey alumna, Distinguished Fellows depart for the orientation at Harvard Kennedy School, Fellows attend a closing reception at Harvard, and Fellow Mauricio Alviar Ramirez meets with Luis Alberto Moreno, President of the Inter-American Development Bank (IDB).